Your highway to healthy, outdoor fun. Take I-80 West from George Washington Bridge through Delaware Water Gap. Next, take PA Exit # 284 (Blakeslee) and travel South on 115 for 2 miles to 903 South. Then, take 903 South for 10 miles – Pocono Whitewater Rafting is on the right -directly on Route 903. Traffic increases dramatically on Race Weekends. Please use the following directions in order to avoid major traffic delays: I-80 West to exit #274 (Hickory Run State Park). Travel East on Route 534 for approximately 10 miles until you reach the intersection of Route 903. 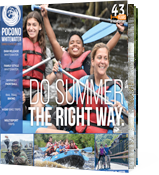 Make a right onto Route 903 South, Pocono Whitewater’s Adventure Center is 6 miles down the road on the right…directly on Route 903. Take I-81 South to 476 (N.E. Extension of PA Turnpike). Take 476 South to Exit #95 (Pocono). Then take I-80 East one exit to Exit #284 (Blakeslee). Next, take PA Exit # 284 (Blakeslee) and travel South on 115 for 2 miles to 903 South. 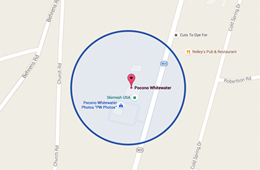 Take 903 South for 10 miles – Pocono Whitewater Rafting is on the right-directly on Route 903. There is a new E-ZPass Only exit off of I-476. If you are an E-Zpass user, we recommend these directions to save some drive time. Take I-81 South to 476 (N.E. Extension of PA Turnpike). Take 476 South to Exit #87 (Jim Thorpe/Lake Harmony). Travel South on Route 903, Pocono Whitewater’s Adventure Center is a few minutes down the road on the right…directly on Route 903. Take I-78 to Allentown, and then travel North on 309 to US 22 W. Follow US 22 W. to PA 476 Turnpike (NE Extension). Take 476 North to Exit 74, Mahoning Valley (This is the first exit AFTER you go thru the Lehigh Tunnel). *Pay your toll, then take the left exit ramp and bear to the left. Turn left onto Rt. 209, then make an almost immediate left onto Harrity Road. Go over small concrete bridge (you’ll see P.J. Whelihan’s restaurant on the right). Follow Harrity Road to the end. Turn right, follow Pocono Whitewater signs up the mountain to Rt. 903. Then turn right onto Route 903 north and follow 3.8 miles to Pocono Whitewater. Pocono Whitewater is on the left, directly on 903. There is a new E-ZPass Only exit off of I-476. If you are an E-Zpass user, we recommend these directions to save some drive time. Take I-78 to Allentown, and then travel North on 309 to US 22 W. Follow US 22 W. to PA 476 Turnpike (NE Extension). Take 476 North to Exit #87 (Jim Thorpe/Lake Harmony). Travel South on Route 903, Pocono Whitewater’s Adventure Center is a few minutes down the road on the right…directly on Route 903. Take Northeast Extension of PA Turnpike (476), to Exit 74, Mahoning Valley (This is the first exit AFTER you go thru the Lehigh Tunnel). There is a new E-ZPass Only exit off of I-476. If you are an E-Zpass user, we recommend these directions to save some drive time. Take 476 North to Exit #87 (Jim Thorpe/Lake Harmony). Travel South on Route 903, Pocono Whitewater’s Adventure Center is a few minutes down the road on the right…directly on Route 903. We strongly suggest NOT using online mapping sites such as Mapquest & Yahoo Maps. We’ve found that using these sites at times will take you hours out of your way!